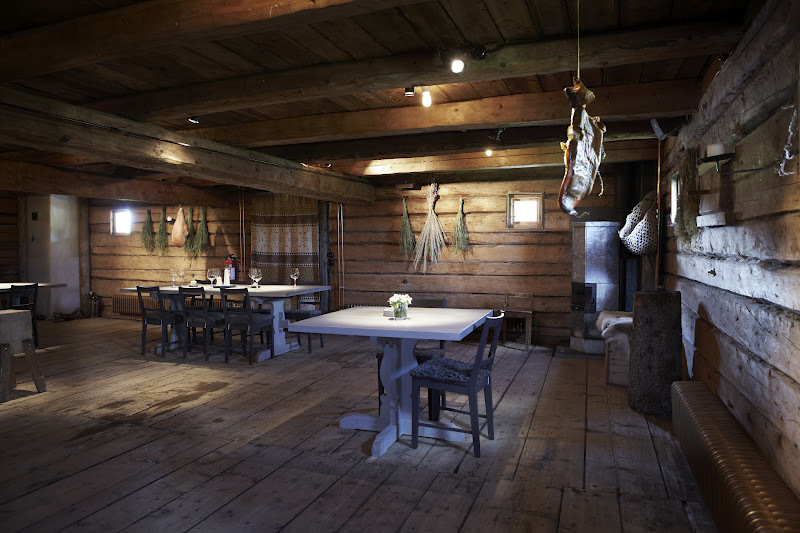 The atmospheric Fäviken Magasinet is housed in an old grain barn. I was a little apprehensive about my third visit to Fäviken Magasinet, the acclaimed restaurant run by young Swedish Chef of the moment, Magnus Nilsson, since often when you revisit a place, which you've been raving about, you are disappointed. But I shouldn't have worried, because this time the food was - if possible - even more exquisite. Magnus approach to cooking is twofold: firstly, apart from salt and vinegar, he will only use locally grown and sourced foodstuffs; secondly, he puts his imagination and great talent as a chef towards utilising as much of the fauna and flora at his disposal in the grounds of the restaurant and the surrounding forests, waters and farms, as possible. The result is the purest and cleanest tasting food you can ever imagine you could eat. Magnus calls it Rektun Food (Rektun means real in the local Jämtland dialect). 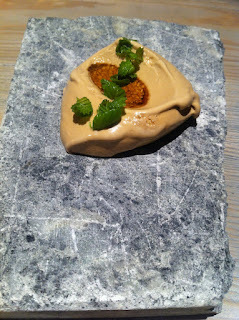 Saturday before last, when we visited the Fäviken Magasinet, the evening started with little amuse-bouche including wild trout roe served on top of a biscuit made of dried pigs blood, something which sounds strange but was incredibly tasty. We also had thin slivers of cured bacon which just melted in the mouth. Then it was time to go upstairs to the restaurant proper, which is housed in an old grain store with low ceilings. Dried herbs, hams and fish adorn the walls. This is where the theatre that is the Rektun meal begins in earnest. Each course is brought to the table by Magnus and his staff and the chef himself explains what we are about to have and how we should consume it to best enjoy the dish. There are eight small dishes, served to a maximum of twelve guests, with each dish wilder than the previous one, followed by four puddings. Magnus preparing a dish for us. 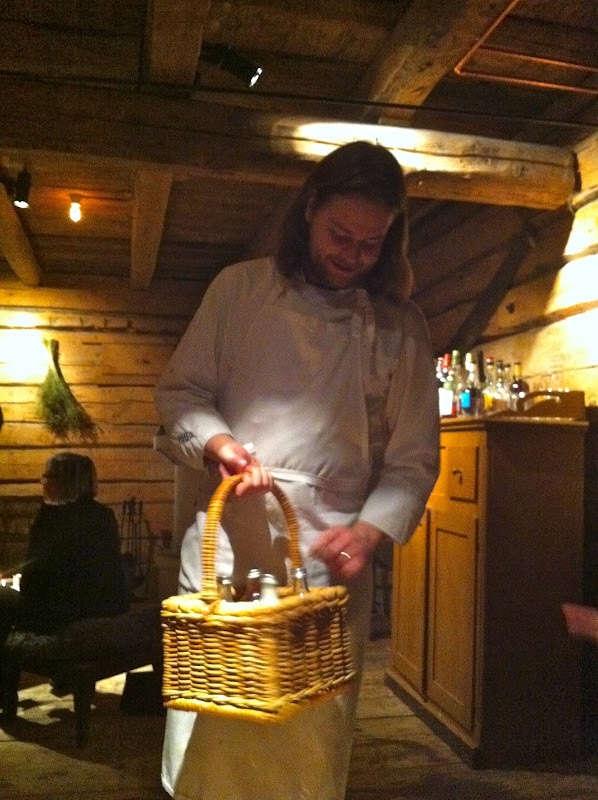 The atmospheric surroundings greatly add to the magical Fäviken experience. The carefully selected wines by Magnus together with his talented Somelier, Johan Agrell, are French, apart from the mead made by the restaurant, which is served with the first course of flame 'cooked' scallop in its shell. The scallop which is more of less rare, was the best I have ever tasted. My friend and I speculated whether we could ever eat scallops anywhere else again, as they would always be a disappointment after the one served at Fäviken. The scallops, served in their shell, on a bed of smoked hay and sprigs of juniper. 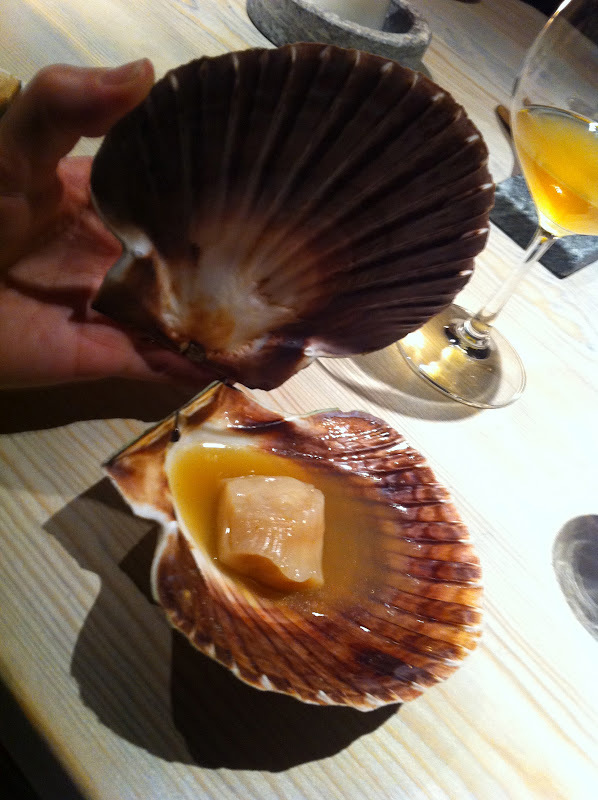 The juice inside the scallop was divine. Langoustine rolled in dried malted vinegar. One dish which stood out for me more than others was the trout, marinated in mushroom vinegar, served with a sauce made from roasted oats. Magnus told us the marinated fish had only been slightly 'cooked' by placing the piece on the hot serving plates. The sauce made from oats had a sweet taste, of almost butterscotch, which together with the mild acidity of the fish was a completely new taste sensation to me. Trout, served with sauce of roasted oats and grated carrot. This dish of pickled vegetables was so pretty you hardly wanted to touch it to spoil the effect. 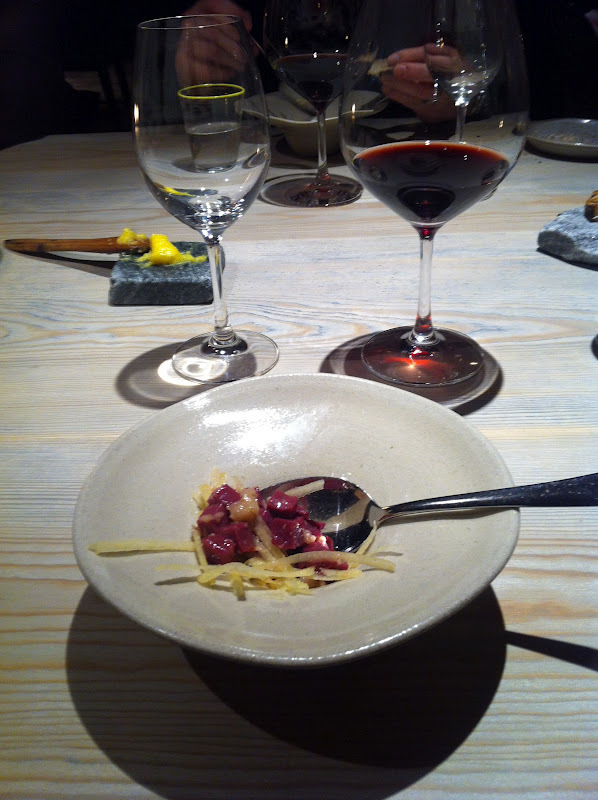 Cow's heart with marrow (which was cut in half in front of the diners) and grated root vegetables. Toasted sourdough bread served with herb salt. 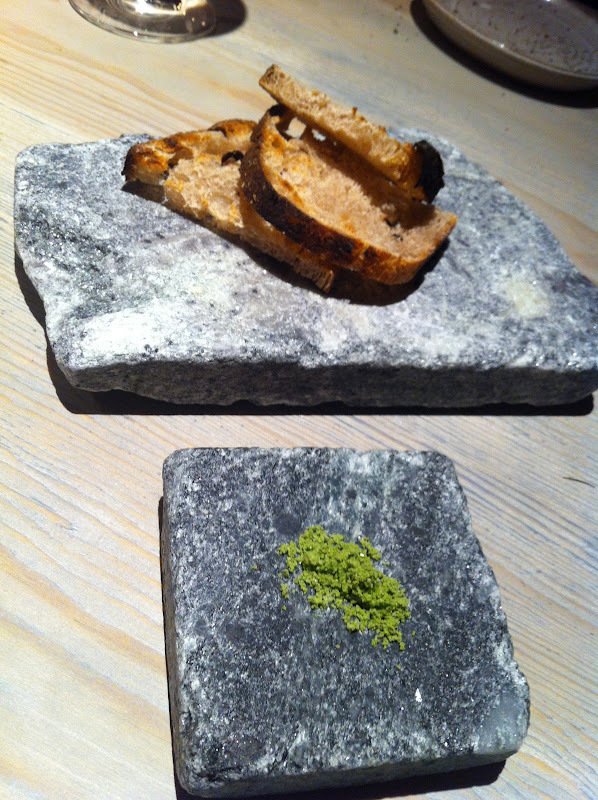 All throughout the meal the staff at Fäviken serve slices of sourdough bread made on site from a root originating from an old wooden bread basin. It's wonderfully soft in the middle and crisp on the outside, and it takes all your self-control not to pig out on it, especially as the bread is served with home-made butter. But luckily for us, my friend is such a regular at Fäviken that when she leaves the restaurant, a loaf of warm bread, wrapped in a brown paper bag, is placed in her hand. I felt honoured that, on this, my third visit, a loaf was given to me too. 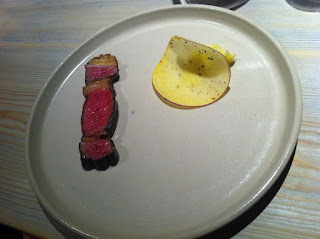 Steak from 'an old pensioned-off milking cow' was the most delicious piece of meat I've ever tasted. 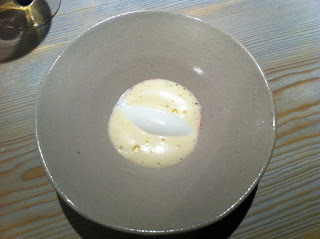 To move from the savoury to the sweet we were served wild raspberry sorbet, water lingonberry with thick cream and sugar. Cake made from pine bark with frozen buttermilk. Milk ice-cream, whipped duck egg and raspberry jam. The sweets were divine too. The milk ice-cream made in the old-fashioned churn, was served with home-made raspberry jam and a whipped duck egg. It was just sweet enough to be the pinnacle of the pudding menu. When the meal came to an end we were invited to return to the downstairs bar/reception area for coffee and home-made liqueurs. Even though I was thoroughly satisfied, I'd enjoyed such wonderful tastes I didn't really want to leave the restaurant. Especially as I knew it'll be a long time before I can make a return visit. 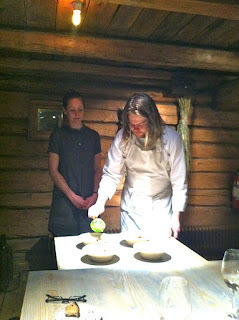 But, there's good news: for those of us who aren't able to make regular trips up to Northern Sweden to sample Magnus Nilsson's fantastic cooking, his methods can soon be enjoyed by all. He has a cookery book in the making, which should be out in October this year. He'll also be making a book tour in London to co-incide with the publication of the book, so watch this space for dates and venues.